Although the current building first opened its doors in 1960, there has been a theatre on the site since the 17th century. 'Mrs. Hughes' scandalised the public on 8 December 1660 when she became the first woman actor to take to the stage at the Vere Street Theatre in Clare Market. After the building of Kingsway, the block between Portugal Street and Sardinia Street was taken up by Oscar Hammerstein's magnificent London Opera House seating 2600 with a facade emulating Versailles. The venture was a commercial disaster and the building was sold to Oswald Stoll and renamed after its new owner. The Stoll Picture Theatre presented highly successful variety and revue shows before the nightly film feature up until the 1950s when Anton Dolin's Festival Ballet restored the theatre to a mixed programme of ballet and opera. 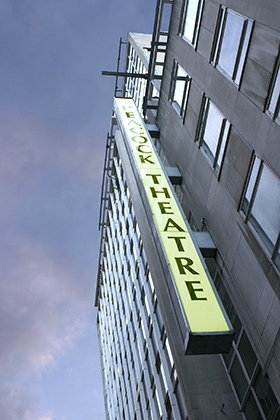 At the turn of the decade, the Stoll was demolished to be replaced by an office block with the Royalty Theatre nestling snugly in its basement. The new theatre seats a modest 1000 and on its opening boasted 'infra-dig' rosewood panelling, a stained glass mural and Aztec-influenced mosaic sculptures on the canopy. Subsequent years saw usage as a TV studio for This Is Your Life and its transformation into a Caribbean paradise for Once On This Island.